I remember about half the time we were socked in and you can only do so much maintenance so we did a lot of card playing. Mine was hearts. One time we were firing at a towed sleeve and the pilot radioed to us to back off as we were crawling up his cable. His cable was steel and our radar moved from the sleeve to the cable and was getting closer than he wanted. 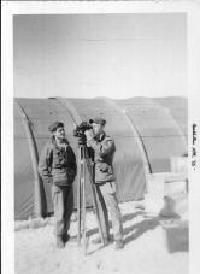 As I said we were a 75 MM unit and were stationed at Loring AFB on site defense of the SAC airbase up there but they sent us to Wellfleet for target practice.